These are studio cuts made between 1970 and 1982. Most of the songs were performed on stage. A couple of the cuts were made from old tapes or vinyls that had been damaged, but our techs did their best to make them sound like the originals. hi guys its took about 30 years for me to find this song from first hearing it on an alias smith and jones. its been well worth it and tim had the courtesy to answer my email to him. hi there Tim at last I have found the man that sings take a look around! I first came across it on the devils hole gang episode of alias smith and jones,I wondered now who sings that, well now I know! and its a free download wow! (so it said on my computor) thankyou tim for such a beutiful song that so much reminds me of the late pete duel when you sing it! I hope you can email me, I may go out for the full CD. pamela G Britain. I am so greatful for the opportunity to enjoy the singing of this incredible performer on a quality CD. With each song Tim Morgon sings I am in that song and I am living that story. I am giving this collection five stars though the recording of "For All We Know" is terribly flawed, as a recording. "Over Wired," the lyrics, that is, are awful, but the music is very good. But the rest of it is just sterling! "Take a Look Around" is easily the best recording with "This is Where I Came In" a very close second. These are pristine recordings, as are all of the others. The only two flawed recordings are those mentioned above, "For All We Know," and "Over Wired," though the recording itself as a recording is a very clear recording; it's only the lyric that is terrible. "Last Train Out" is a song I remember Tim singing at the Pasadena Ice House. A great great recording. For all of you old Morgon fans, this is a "must have" collection. 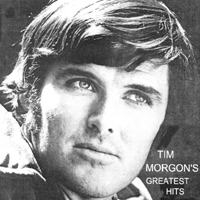 I noticed though, after receiving it, that Tim Morgon left off a recording that I remember hearing much of in the mid to late 60s at the Glendale Ice House...a song titled, "You'll Be Sorry," but can remember little else of it except that he sang it on television a few times about '66-'67. If anyone, including Tim, remembers anything about this recording, that is, if there is a copy of it or even who wrote the song, please let me know. Also noticed at eBay Tim Morgon's movie, "Dirty Feet," is out now, filmed on location in 1965! Maybe Tim will have another collection someday with "You'll Be Sorry" on it? I seem to remember other recordings not included on Tim Morgon's Greatest Hits that came out now and then during the 70s that he sold to fans at the Pasadena Ice House? One title was something like "Don't Tell Me I Lie" I think, or something like that??? I like the variety of songs on this CD. The way Tim Morgon sings them makes you feel the emotions he's singing about. I sort of missed the comeraderie and reaction of a live audience but the songs themselves were great!